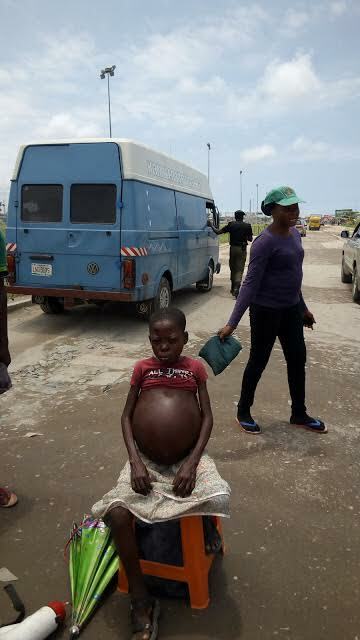 It was a show of shame and sorrow on Tuesday at the ongoing Trade Fair in Lagos State as a group of persons who paraded themselves as members of a Non-Governmental Organization, NGO, were seen at the Trade Fair complex in Orile-Badagry Expressway, Ojo, with a sick child begging for alms. The little girl with protruded stomach was subjected to pain under the scorching sun by the said NGO seeking donation for her treatment. According to reports, they (a lady and two men) are suspected fraudsters parading themselves as members of an NGO. While they were soliciting for funds from well-meaning Nigerians, an elderly woman who simply identified herself as Iya Bose tried to know about the NGO they represented, but the leader (the lady), couldn’t produce any form of ID card. It was gathered that she shunned the woman, asking her to keep her nose off their affairs. Iya Bose raised the alarm which attracted a crowd and some journalists were said to have asked further questions, but the leader and her accomplices could not prove they belonged to any NGO. The leader of the gang, whose name could not be ascertained, was thereafter, labelled a fraudster. In the midst of this, Iya Bose was said to have notified a soldier who was close by and realizing the case had gone out of hand, the lady reportedly pleaded for mercy and upon interrogation, the lady claimed that the girl was brought from Abuja, while her co-worker said that the girl’s parents live at Orile, Coker area of Lagos. Newsmen further asked the sick victim where her parents resided. She shocked the crowd when she responded contrary to what the leader of the fake NGO said. According to the girl, her parents are in the village in Abakiliki, the Ebonyi state capital. She added that those people (fake NGO) brought her from the village, disclosing that she was told to smile and wave at people driving bye so they would be pushed to donate. 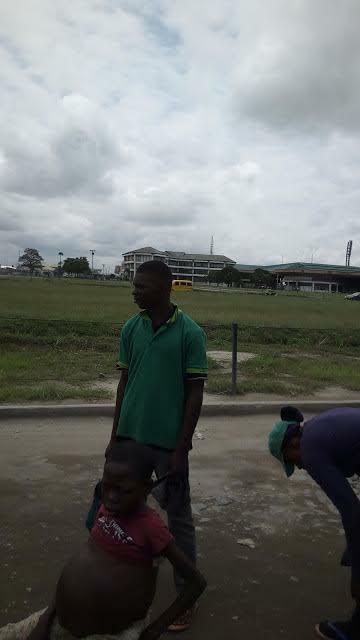 One of the policemen (as seen in one of the pictures) reportedly tried to liaise with the soldier to bury the case after one of the ‘NGO’ members ‘reasoned’ with him and his squad. 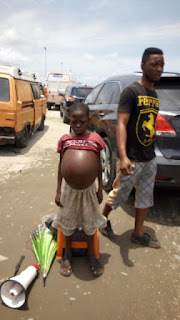 Meanwhile, checks revealed that this little girl is seen most times on the streets of Abuja, with these same people, begging for alms. As at press time, the Lagos State Police Command spokesperson, Dolapo Badmos could not be reached for comments.